Even when you’re marrying a royal groom who isn’t technically royal anymore, you need a serious tiara. This is perhaps even more true when you’re marrying the man who is the heir to the headship of the House of Orléans (and therefore will eventually be one of the pretenders to the French throne). This turquoise and diamond tiara, the de Tornos Tiara, was the tiara of choice for Philomena de Tornos y Steinhart, who married the Duke of Vendôme in 2009. 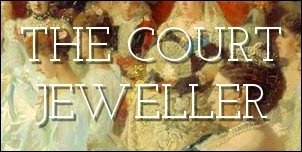 While some royal brides wear tiaras from their new marital families on their wedding days, noble brides who have access to tiaras from their own family’s collection often sport those sparklers instead. This tiara, a modified fringe made of alternating, spaced spikes of diamonds and turquoises, comes from Philomena’s family, not the Orléans vaults. Philomena is descended from Spanish nobles; her grandfather was the private secretary of the Count of Barcelona, who was the grandfather of the current king of Spain. The turquoise tiara was lent to Philomena by her aunt, María del Mar de Tornos y Zubiria. The sparkler, which is a de Tornos heirloom, apparently dates to the early nineteenth century. It’s unusual, but not unprecedented, to see a royal bride wear a tiara with colored stones on her wedding day. Philomena’s wedding dress was also more colorful than many bridal gowns; it was designed to mimic fabrics hanging at the Palace of Versailles. Since marrying Prince Jean, Philomena has returned the turquoise tiara to her aunt, and now largely wears jewels from the Orléans collection. Perhaps we should play a little game of "redesign it" in the comments?